‘Long Hair’ Leung Kwok-hung, the veteran democracy campaigner and elected member of Hong Kong’s semi-elected legislature, the Legco, has appealed to the supporters of the CWI internationally to exert pressure on the Chinese and Hong Kong authorities over the threat of imminent expulsion of himself and three other legislators from the Legco seats they won in September’s election. The four have been taken to court over alleged violation of procedures, trumped up and imposed retroactively. The prosecution claims the oaths the four swore when assuming their Legco seats were not sufficiently “sincere” as defined by the Chinese dictatorship and its Hong Kong puppet regime. This court action, initiated by outgoing Chief Executive Leung Chun-ying, establishes a new precedent for keeping oppositional voices out of the Legco and erasing tens of thousands of votes cast in the September elections. It is a judicial “coup” against the results of these elections, which did not go the way the government hoped. Other events confirm that a major attack on Hong Kong’s democracy movement is being launched by the pro-Beijing establishment. Less than a day after the elite-only ‘election’ for Chief Executive concluded on 26 March, nine politicians and activists associated with the 2014 mass Umbrella Movement were arrested and face serious charges that could lead to long terms of imprisonment. It is now an open secret that the Chinese regime intends to “rule Hong Kong through the courts” – using pseudo-legal means to clamp down upon and neutralise the leaders of the democracy movement. This new and serious level of attacks can only be resisted by vigorous protests and a strategy to rebuild a fighting and truly mass-based democracy movement, with genuine internal democracy rather than a top-down approach. 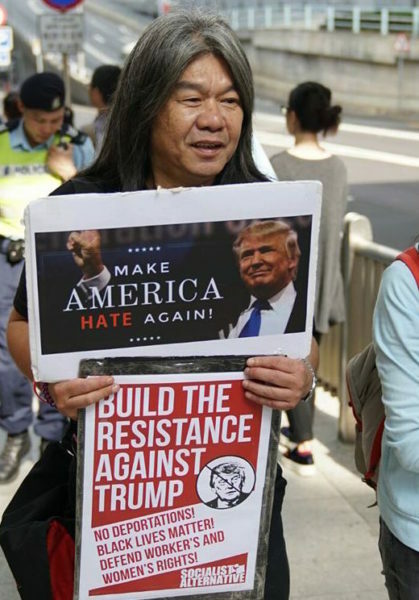 ‘Long Hair’ marching against Donald Trump with Socialist Action and ‘Anti-Trump Hong Kong’. The other three legislators under threat with ‘Long Hair’, who represents the League of Social Democrats (LSD), are Nathan Law Kwun-chung of the youth party ‘Demosisto’, the independent pan-democrat Edward Yiu Chung-yim and Lau Siu-lai of ‘Democracy Groundwork’. They are all from the opposition to Hong Kong’s unelected government. Lau and Law are newly elected, sent into the Legco by the unprecedented anti-establishment wave of the September elections, which saw one in four voters choose ‘radical’ candidates – a result that shook the ruling elite. Long Hair is a veteran anti-government campaigner who was elected for the fourth time. The case against them is based on an ‘interpretation’ by China’s unelected National People’s Congress Standing Committee (NPCSC), handed down after the elections and after all the oaths had been sworn. It retroactively imposes new criteria for oath-taking by legislators, which previously was covered only by the statutes of the legislature itself (a legislator could only be removed by a two-thirds majority in the Legco, and only then in cases of serious misconduct such as corruption). The new rules were first imposed by the NPCSC in October 2016 to remove two legislators from the racist right wing ‘localist’ movement. This purge has since been widened to strike a blow at the democracy movement in Hong Kong. It is part of a broader onslaught on democratic rights in Hong Kong – an attempt by the Chinese regime to impose political screening on the legislative elections, allowing the authorities to weed out ‘troublesome’ candidates while reinforcing other anti-democratic measures. This trend has dashed public hopes for greater democracy and free elections which created the explosive conditions behind the 2014 mass ‘Umbrella Movement’. The disqualification of the four would prepare the ground for the reintroduction of Article 23 legislation – a tough national security law that was defeated 14 years ago by mass protests. This is part of the agenda of Carrie Lam Cheng Yuet-ngor, the hardliner pro-Beijing politician recently ‘elected’ Chief Executive by only a few hundred elite votes (a total of 777 votes). Article 23 would severely restrict free speech and the right to protest and could possibly designate the CWI as a “foreign organisation” and make it illegal in Hong Kong as it already is in China. The case against the four lawmakers is weak and arbitrary. Long Hair’s oath is being challenged as insufficiently “sincere and solemn” because he used props – a yellow umbrella (the symbol of the mass 2014 struggle) and because he tore up a picture of a controversial NPC ruling – while reading the oath. He has been elected to the legislature three times previously (2004, 2008, 2012) and conducted himself no differently – yet those oaths were never challenged. The prosecution alleges that Law’s oath is ‘invalid’ because he chanted some slogans before and after reading it. Lau is accused of speaking too slowly and “pausing too often” during the reading. 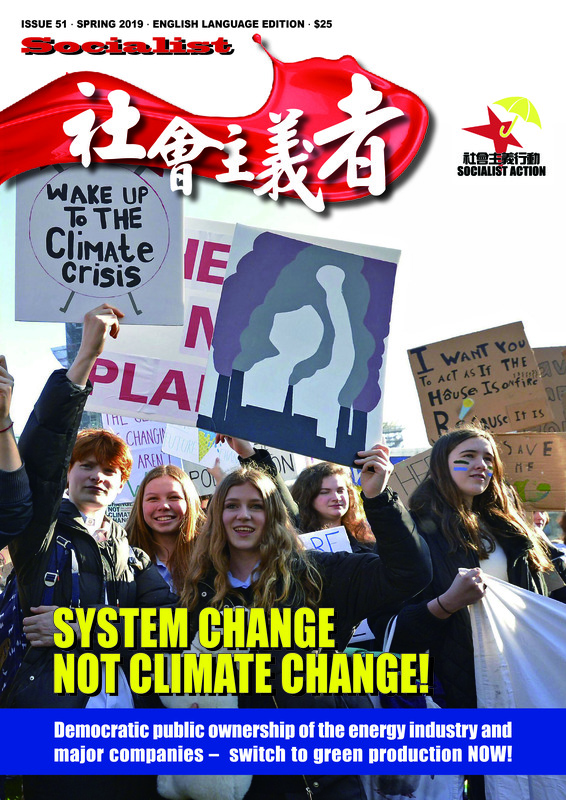 Socialist Action, the supporters of the CWI in Hong Kong, is looking for solidarity protests from other CWI sections and supporters in the wider labour movement. There is very little time before the courts could reach a judgement. The legal process against the four was put on hold while the fake (elite-only) Chief Executive election was underway, but with that wrapped up on 26 March, the court case against the four will resume possibly in early April. We are calling for solidarity protests around the date of Wednesday 12 April. This is the 90th anniversary of the horrific massacre and counter-revolution against China’s young communist-led workers’ movement in 1927, by Chiang Kai-shek’s ‘Kuomintang’ army. That event led to the dictator’s ‘White Terror’ when hundreds of thousands were killed and arrested. Stop the attacks on democratic rights in Hong Kong! 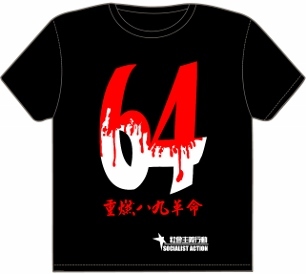 No to disqualification of Leung Kwok-hung and the four Hong Kong lawmakers! Drop the charges against the nine Umbrella Movement politicians! 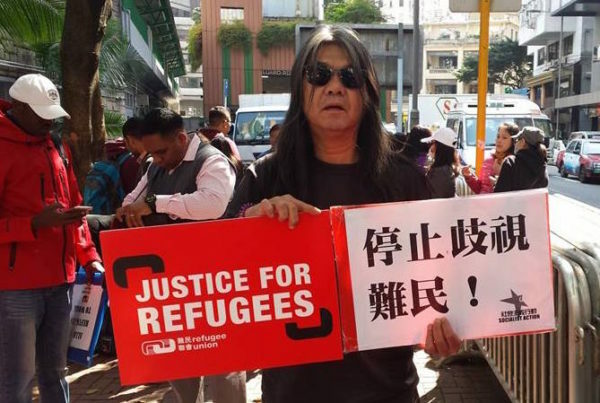 Leung Kwok-hung (‘Long Hair’) defending refugee rights.